You want to grow your talent. We develop high achievers. OPRA design and deliver award-winning leadership development and talent management programmes that transform lives and produce measurable results. Each programme is built with the adult learner in mind, and uses a combination of blended learning that is supported by inspirational content and contemporary research. Not only does our approach make the learning more engaging, but provides greater assurance that knowledge will be embedded and that participants will experience sustained behavioural change. All our talent and leadership development programmes are built on the principles of positive psychology and an understanding that REAL learning only occurs when self-awareness, participation, and a tangible sense of progress are evident. Alongside OPRA REAL® we incorporate blended learning that works using a comprehensive mix of psychometric assessment, face-to-face workshops, self-directed learning assignments, on-going coaching, and performance support aids. In addition, we offer train-the-trainer options to build in-house capability that enables you to cost-effectively maintain programme momentum. Treat the 10 most frequent unhealthy attitudes and upskill staff in proven Emotional Algebra™ techniques to effectively manage such things as stress, frustration, and anxiety. A multi-award winning programme to equip staff more effectively recognise and respond to emotions, as well as enhance their impact, influence, and emotional resilience. Equip individuals to challenge redundant mental models, learn from new experiences, and apply their knowledge to perform in new and challenging situations. Explore engagement in terms of role, team, manager, and cultural factors and create a shared responsibility for lifting engagement between a manager and employee. Immerse people in a team-building experience and provide them with a common language to better leverage off their own and others contribution to the group. Developing high functioning leaders requires a systematic, methodical approach underpinned by proven science. 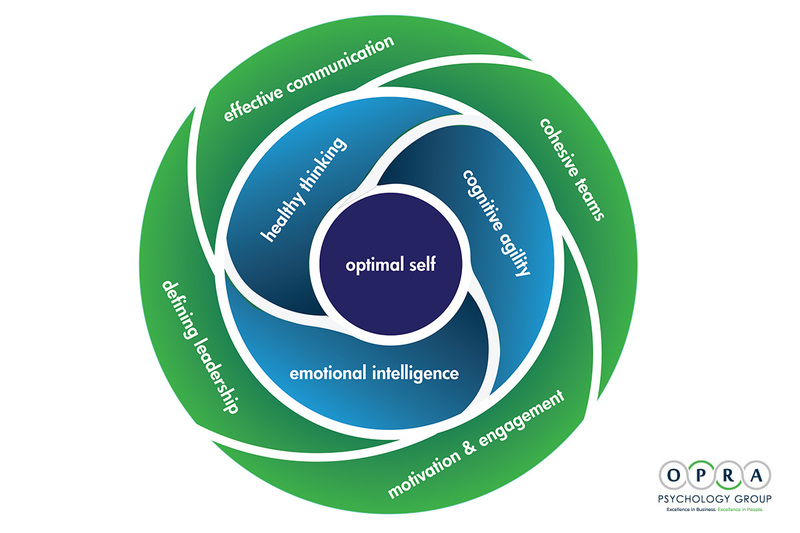 OPRA has reviewed the psychological literature to identify the core components of leadership development and combined these components into a unique programme to help leaders realise their potential. Starting with the development of self, the programme focus on optimising performance through a deep understanding of participant strengths and weaknesses and developing the strength of character to engage with the world with purpose and integrity. Key skills such as emotional intelligence, cognitive agility and healthy thinking supplement this self-knowledge to ensure participants can realise their true potential. Having developed oneself, a person is then able to be a credible leader of others. Similar to the development of self, being able to develop others requires mastery of key skills such as effective communication, managing, motivating, and understanding others. Time is crucial, and the good leadership training needs to develop the optimal leader in the shortest time by focussing on the critical skills that make a difference. Through a blending learning approach, OPRA can develop leaders to help them realise their potential, in the quickest possible time.